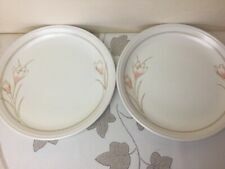 Biltons Spring Bouquet / Crocus pattern 2 x dinner plates in used but good condition utensil marks but plenty of life left. Measure approx 24.40cm wide. Some different stamps Coloroll Biltons Staffordshire But all the same size and design. 3 lots available. Biltons / Coloroll Spring Bouquet / Crocus pattern 2 x soup / cereal bowls in very nice used but good condition. Measure approx 6.1/2” wide. BILTONS 'SPRING BOUQUET' TEA/COFFEE POT. Biltons Spring Bouquet Crocus 2 x side plates. Lightly used but very good condition with only minor utensil marks. Measures just under 17cm wide. The pot holds 2 pints of liquid. Biltons Coloroll Spring bouquet X2 supper breakfast dinner plates 9"
Two handy-sized supper or small dinner plates in the popular Spring Bouquet pattern by Biltons/Coloroll, Staffordshire. Biltons Of Stafordshire. Saucers Breakfast Plates. "Spring Bouquet". Excellent Condition. 16cm cereal bowl. Spring Bouquet design from Biltons. A large soufflé / oven / serving dish in the Spring Bouquet design. BILTON SPRING BOUQUET CROCUS DESIGN SUGAR JAR EXCELLENT CONDITION. The Casserole Bowl has a baked on Oven mark around the inside & there are a few marks on the Outside. The Saucers all have marks on them. Biltons Coloroll Spring Bouquet X6 supper breakfast dinner plates 9"
Six handy-sized supper or small dinner plates in the popular Spring Bouquet pattern by Biltons/Coloroll, Staffordshire.